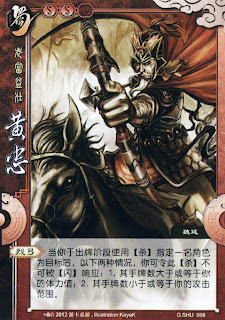 "Old but Vigorous 老当益壮 (lǎo dāng yì zhuàng)"
Quite possibly the oldest general by age in Romance of the Three Kingdoms. By the time of his fatal injury that he sustained in combat, Huang Zhong was already 75 years old. His age is probably exaggerated, much like many of the other details in the story. In fact, no record exists that could determine his age. The legend of Huang Zhong is, therefore, 80% influenced by Romance of the Three Kingdoms and not so much by true history. Nonetheless, Huang Zhong was an incredible general, very powerful in combat and deadly accurate with the bow and arrow. The game makers of San Guo Sha 三国杀 really put his attacking abilities to the extreme! More about his character abilities below. Character ability: " Fearsome Archer 烈弓 (liè gōng)"
1. The number of on-hand cards of the target player is greater or equal to your current units of health. 2. The number of on-hand cards of the target player is smaller or equal to your attack range. The ability description is slightly changed to clarify the timing to activate “Fearsome Archer”. If you are not a stickler for fine details in wording, the ability is essentially the same. I wonder if the game makers are helping Huang Zhong make up for his age by giving him such an extreme character ability. Nothing close to this kind of combat prowess (where enemies cannot escape his attacks) is described in the story. A thin link to the story is possible when you consider that Huang Zhong is a celebrated archer. Perhaps the game makers wanted to give this famous archer the advantage by matching his weapon. Read about his matching weapon below. In fact, Luo Guanzhong portrayed Huang Zhong as an outstanding archer. When Huang Zhong was first introduced in the story, he was said to able to bend the three-hundred-pound bow and possessed perfect accuracy. When he fought Guan Yu 关羽, he managed to fake Guan Yu twice with his bow, and then he shot an arrow that could kill Guan Yu instantly. However, he did not want to kill Guan Yu since Guan Yu spared his life once, so he shot an arrow that stoke the plume of Guan Yu’s helmet intentionally. Wow! According to Zhuo You Zhi magazine, the two pre-requisites of “Fearsome Archer” referred to two of Huang Zhong’s characteristics. Long attack range referred to his marksmanship, while low health refers to his age. When one of these pre-requisites was fulfilled, he could strike his enemy with his marksmanship.